This mini modern girl mouse pendant in sterling silver is simply adorable, especially when personalized with her initial! This two-sided pendant is pavé set with sparkling Diamonlux™ CZ's she will find un-bow-lievable. Custom engraving options are now available with beautiful new fonts specifically designed for children and for Tiny Blessing's stunning line of jewelry. 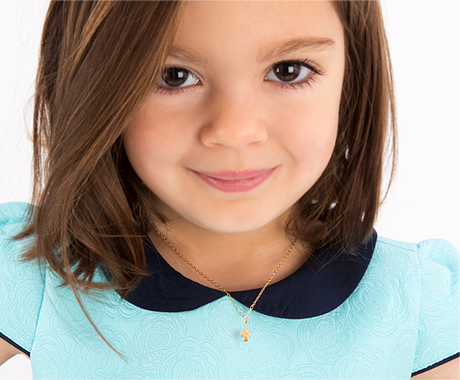 Master engravers beautifully personalize her initial on the front for that perfect little necklace for your perfect little girl. Though this mouse is tiny, she is sure big on cuteness! Mini Sliding Pendants are custom made just for Tiny Blessings and are made to slide over our chains. These fun little pendants typically stay in the center position on chain but are not fixed and will tend to slide on chain and flip back and forth with movement. Due to the size of the pendants, only 1 initial is available for engraving to allow for legibility. Please note that when selecting her initial, personalization is case sensitive and character will be engraved as ordered.